Likely one of the most consistent fisheries on the west coast, Halibut opportunities exist year round on Northern Vancouver Island. 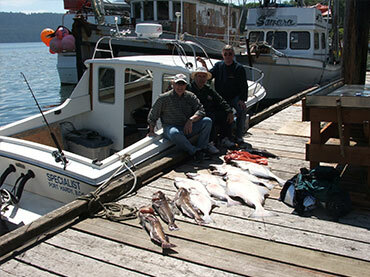 With vast areas and a variety of terrain to fish, Port Hardy is by far the best place to try for Pacific Halibut. The area boasts shoals, banks, trenches, rock piles and reefs, all of which hold halibut. 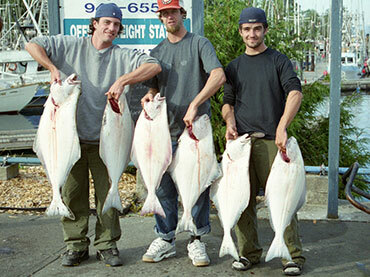 Almost 50% of commercially caught halibut in Canada is landed in Port Hardy! 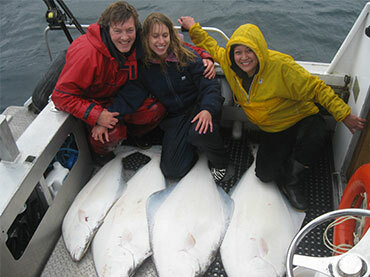 Although we like to keep the smaller ones to eat, each year a few of our clients catch and release halibut over 200lbs. Our experienced guides have spent countless hours chasing halibut, some as commercial fisherman and know how to release these large females unharmed. Needless to say, we pride ourselves on our ability to put halibut in the boat. With many tricks up our sleeves, the guides at Tides and Tales fish for Halibut between 30 and 500 ft in every type of habitat. Techniques vary from jigging to trolling, and sometimes even anchoring for this exciting game fish. With our experienced team of guides working together, we are able to stay on top of the fish ensuring our clients get an excellent opportunity to catch halibut. When bottom fishing for halibut, our guests often catch lingcod, snapper and rockfish in the same locations; Anglers can also have the opportunity to try for both bottom fish and salmon in the same day. Whether you are a new angler or salty dawg, call the “Halibut Whisperers” at Tides and Tales (1-877-694-3474) to book your next Halibut fishing trip. The Winter Chinook (King) Salmon fishery is in full swing, and there appears to be a few fish around! With the Herring spawn just around the corner, we are finding the salmon near the concentrations of herring. The cut plug seems to be the most productive tackle. We are seeing Winter King salmon (Chinook) consistently in the 8 - 12 lb range on every charter, with the odd specimen in the low 20‘s! Lets hope this is an indicator of what we will see next summer! The Halibut season will likely begin in March and carry right into next fall. Halibut fishing is still open, and has been solid all season with fish in the 25 - 75 pound range being caught regularly. The halibut have had a sweet tooth for octopus, but are now starting to develop a taste for Herring as we get closer to the spawn. Being voracious feeders, halibut will eat just about anything, but they do have their favourites! We have had an incredible fall fishery for Halibut. Lots of catch and release after limiting out! This has to have been the best fall Halibut fishing we have seen! If you are interested in doing some Salmon or Halibut fishing now or in 2014, Call Mike @ 1-877-694-(FISH)3474 for details.